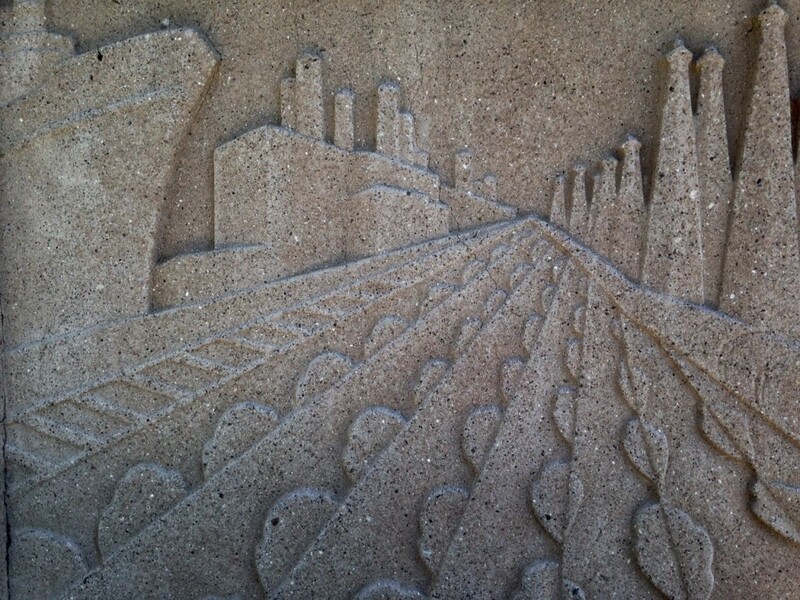 the Great Depression by Los Angeles sculptor Ada May Sharpless. 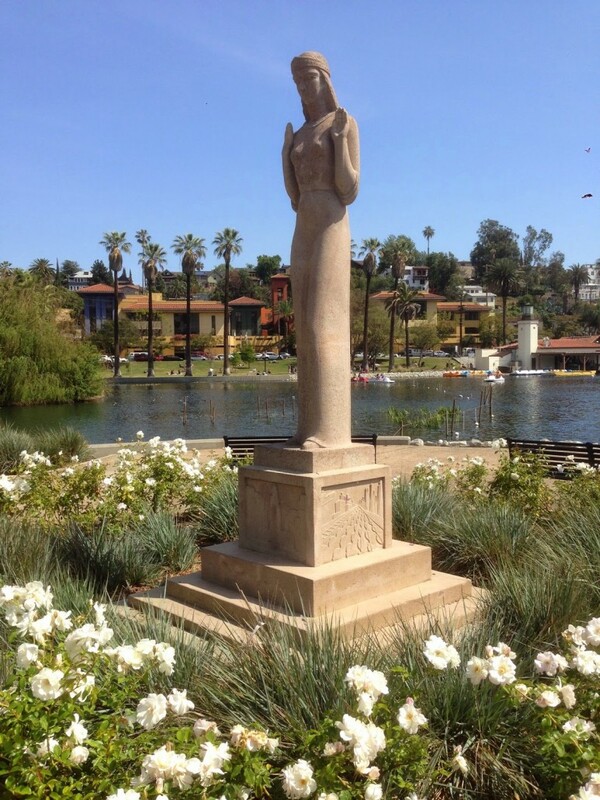 The Art Deco statue, with its gently curving features and Egyptian styling, stands on one of the choicest spots at Echo Park Lake: surrounded by rose bushes, and with a backdrop of the lake and the downtown skyline. The Lady of the Lake — originally known as Queen of the Angels — also stands on a base that pays loving tribute to L.A.’s landmarks and locales. relocated to a spot near the boathouse. Sharpless, born in Hawaii and raised in Orange County, created the Queen of the Angels at a studio at 2970 London Street * in Silver Lake, according to a report in the June 1,1934 issue of the Los Angeles Times. The work was one of many commissioned as part of the federal Public Works of Art Project, part of President Franklin Delano Roosevelt’s New Deal, which put people back to work during the Depression. 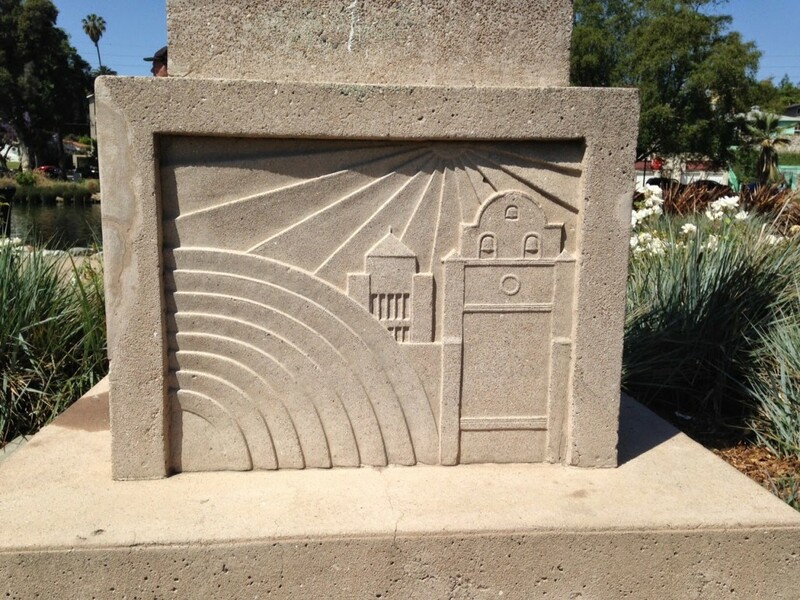 The statue was completed in May 1934 and displayed months later along with the works of nine other artists by the Ebell Art Club. Although it was the centerpiece of the show, it failed to win over one prominent critic: Times art writer Arthur Millier. Five years earlier, Millier had lavished praise on Sharpless, saying she had submitted the “star piece” of California Art Club’s annual exhibition. But after visiting the Ebell Club’s art salon, he informed readers that Sharpless’ piece lacked much needed subtlety. “It is not her happiest work,” he sniffed. . Perhaps he didn’t like the statue’s deferential posture? the Queen of the Angels stands tall, surveying the park and its many visitors. * An LA Times story from 1933 said Sharpless lived at 1142 1/2 Seward St.